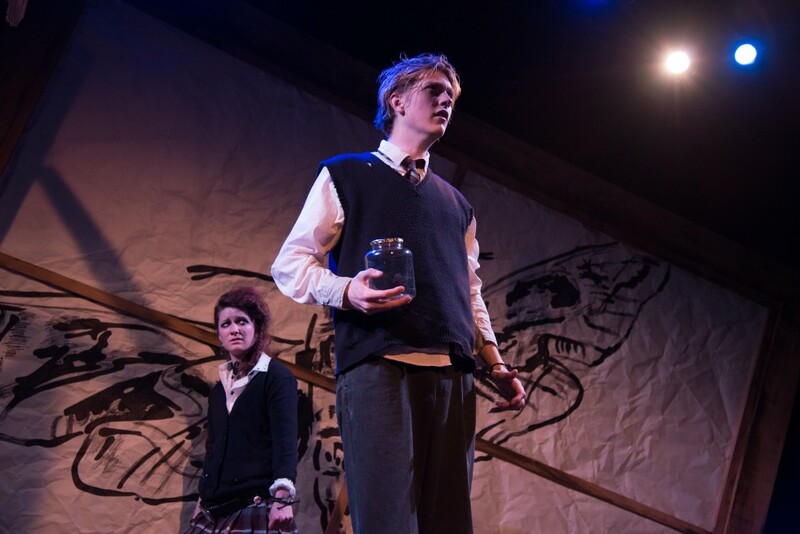 Hannah Parke (Claryssa) and Nicholas Scheppard (Sebastian) in MOTH. Photo by AustinArt.Org. Azuka Theatre closes their season with a Philadelphia premiere of Australian play MOTH by Melbourne-based playwright Declan Greene. A moth in a jar appears to a bullied high school student, Sebastian (Nicholas Scheppard), after a traumatizing attack and terrifying holy vision. A grisly angel, an incarnation of St. Sebastian modeled after human Sebastian’s love of anime series Neon Genesis Evangelion, warns him of imminent apocalypse, and his role in the salvation of mankind. Like many others before him suffering delusions of grandeur, Sebastian interprets this doomsday message as a call to violence. In the play’s dreamlike and cyclical structure, Sebastian and his constantly angry friend Claryssa (Hannah Parke) recount the days leading up to the vision, and Sebastian’s subsequent downward spiral. Director Michael Osinski dives beyond the obvious theme of revenge at hand and tackles this play as a dissection of troubled teens’ compulsion towards self-destruction. In the first moments of the play, a brief, wordless prologue, Sebastian and Claryssa are drawn towards an awesomely bright light source. From the beginning of the play, or even earlier, once you as an audience member have your program in-hand, you are aware of the clear moth-drawn-to-flame metaphor that exemplifies these characters downfall, and therefore, that some awful tragedy has already taken place. Greene takes an abstract approach to the narrative, introducing us to our high school anti-heroes in a timeless non-space, the events of the story already behind them, and for some inexplicable reason, they must re-live the entire story. The memory world, and the world which they are remembering, overlap – at one moment Sebastian may be speaking to Claryssa who will respond to him both as herself, and another character, simultaneously. Hannah Parke (Claryssa) and Nicholas Scheppard (Sebastian). Photo by AustinArt.Org. The bold dramatic structure maintains the only tension in the play as that unnamed, terrible occurrence whose reveal the audience must await with bated breath. Other than this essential mystery, MOTH lacks a tangible central conflict. It features simplistic, one-sided characters, whose shallow emotional wells never let us fully relate to them. Perhaps we would in a more linear narrative. However, given the characters’ duties not only to act but also narrate their own, and each other’s, actions, Greene does not make much room for complexity. Given the shortcomings of the script, MOTH’s two young actors make a concerted effort to flesh out their roles. Hannah Parke as Claryssa also shines as several other of their horrible classmates. Nicholas Sheppard, playing Sebastian, delivers a frenetic performance overflowing with manic energy and youthful emotion. Alyssandra Docherty’s lighting design for MOTH is stellar; the small grid in the Louis Bluver Theater is utilized to the fullest with the many subtle mood shifts in Docherty’s illumination. Thanks to her, no two scenes look the same. Parke and Sheppard play upon scenic designer Apollo Mark Weaver’s post-apocalyptic, disjointed set; it’s your standard “non-place” design in which fixed, unmoving structures become many different objects and locales fluidly. 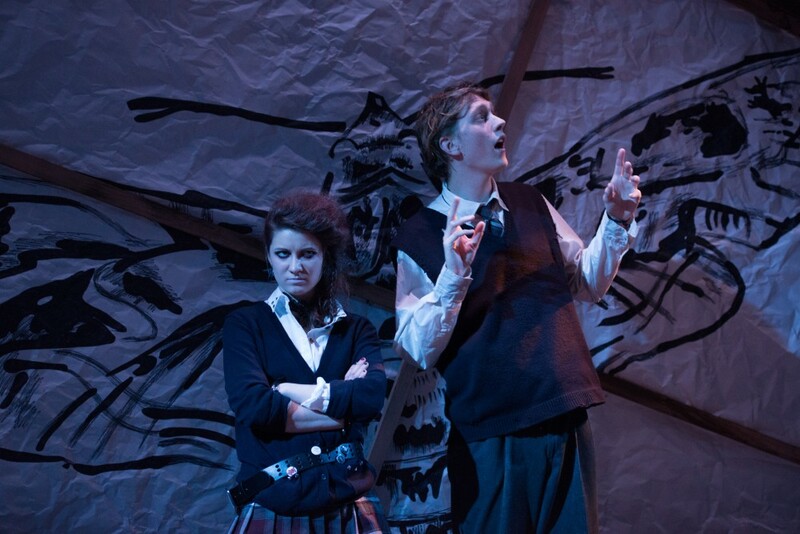 Weaver does, however, introduce elements of typical school atmosphere into the design, such as the pieces of paper hanging above the stage, foreboding and hinting at imminent destruction. Kayla Speedy instills some acute attention to detail in her otherwise nondescript school uniform costume design, especially in the Sharpied-on designs on Sheppard’s backpack and all the buttons and Jack Skellington belt donned by Parke. While its opening moments certainly intrigue and amuse, MOTH loses steam as it chugs along. There is no clear reason for its particular dramatic structure. 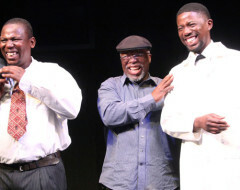 Azuka has excelled in recent years with its plays’ solipsistic teenage characters, but MOTH misses the mark. [Louis Bluver Theatre at The Drake, 302 South Hicks Street.] May 4-22, 2016; azukatheatre.org.